Ready-Set-Read: Oh Baby, It's Friday!!! Look how big my baby boy is getting!! This is my mommy's blog. She really, really, really likes books. She loves to read to my older brother (2) and me. She's always cartin' us around to different places to experience what we read about. She does all these art projects with the brother. ﻿She used to be a reading specialist but now she stays home with us and sings all these silly songs to us and recites poems... and then she blogs about it all right here. So, stick around. Say hello to my mommy and she'll come say hello to you! Ps. Become a follower, and you'll be able to see more cute pictures of ME! That face is too adorable! Looks so Happy swinging. I am your follower. You can follow me back at http://showmemama.blogspot.com. Make sure you leave a comment so I know you visited. Stopping in from blog hop Friday and I'm your newest follower! Your little one is absolutely adorable and my family loves to read! Hope you'll stop by and consider following me back. Have a great weekend! He is soooo cute! I love it! Thanks for stopping by to check out my boys playing! 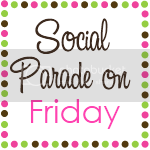 I'm a new follower from Social Parade Friday and would love if you could follow me back!